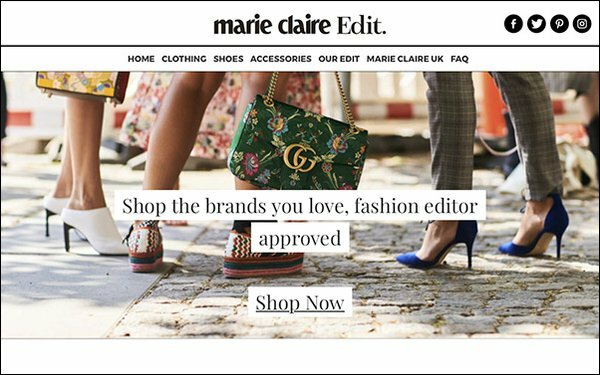 Marie Claire UK has launched Marie Claire Edit, a shopping platform where the magazine’s fashion editors aggregate the latest trends for readers to purchase. Marie Claire gets a cut of the purchases via affiliate links, adding revenue from new native formats and social campaigns. Marie Claire Edit. “offers a new point of purchase, leveraging Marie Claire’s digital reach in fashion, which delivers strong SEO by targeting all long-tail keyword shopping terms,” according to a statement. Designed and built in-house within TI Media, the publisher of Marie Claire UK and the former Time Inc. UK, Marie Claire Edit. lets consumers shop and browse popular brands directly from the magazine's website. “The job we do as magazines is to inspire, curate, edit, recommend and help our readers and customers make choices. Marie Claire has tried to anticipate the way women want to engage with us and to shop,” stated managing director Justine Southall. Its first partner brands and retailers include Farfetch, Net-a-Porter, Selfridges, MatchesFashion.com, Asos and Topshop, among others. Marie Claire UK first dove into the retail space with the launch of its beauty brick-and-mortar store, Fabled by Marie Claire, and the site, Fabled.com. It recently announced it was extending the business online, partnering with next.co.uk to sell items on the platform. The Marie Claire Edit. project was led by Emily Ferguson, Marie Claire’s head of fashion affiliates. The new shopping platform will donate 1% of sales made to the global children’s charity Plan International UK, in an effort to promote children’s rights and gaining equality for girls. Marie Claire has editions in 36 countries. The UK edition claims to reach 5.6 million women every month.